In the past, I'v recommended several of the SysInternals utilities, like Process Explorer and TcpView. But they have many more useful tools and I could probably fill countless posts about them. Well, it looks like I won't have to anymore. Introducing the SysInternals Suite - one download (9mb) that includes all the useful tools (by "useful", I mean it does not include prank apps like the BSOD Screen Saver - kids, DO try this at home, it's fun and harmless). The "suite" is actually one zip file that includes the various exe files (non of SysInternals applications require installation - another reason why I like them). To see the full list of tools included and read about their function, click here. 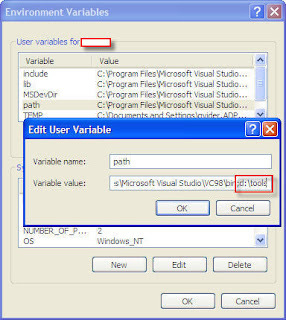 right-click "My Computer" and choose "Properties"
at the end of the line, add ";c:\tools"
To download the suite, click here.